Daisy - delivering pool covers that are built to last! Years of research and development by Daisy under Australian conditions has resulted in technically innovative designs of swimming pool covers that is exclusive to Daisy! The Daisy Series 525 solar pool covers are Daisy's top-of-the-range and the most popular pool cover range. It features Daisy’s trademarked UltraDome technology to last longer and outperform all others in terms of insulation and protection. 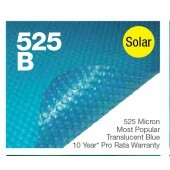 At Pool Supermarket, we stock the complete range of Daisy Solar Pool Blankets 525 micron in translucent blue. Daisy Solar Cover are designed to be used throughout the swimming season, in assistance with a Daisy roller. Rolled out over your pool when not in use the solar cover will warm the water, trap heat, retain that warmth, stop water loss as well as deliver all the other benefits of solar pool blankets. If used correctly, a Daisy solar cover will add months to the swimming season and you can of course leave this cover on your pool over the non swimming months or extended periods of non-use. A solar cover will assist in keeping your pool cleaner.